Can A Microwave Make Decent Chips? | OhGizmo! Can A Microwave Make Decent Chips? We love chips. Maybe not as much as Oprah loves chips, but we do love ’em . We just don’t like the oil as much, even if that is where all the flavour lives. Still, we eat them in moderation, so we’re a little intrigued by the above chip maker. Simply slice potatoes using the included mandoline slicer, arrange the slices on the cooking trays, and insert the trays into a microwave. 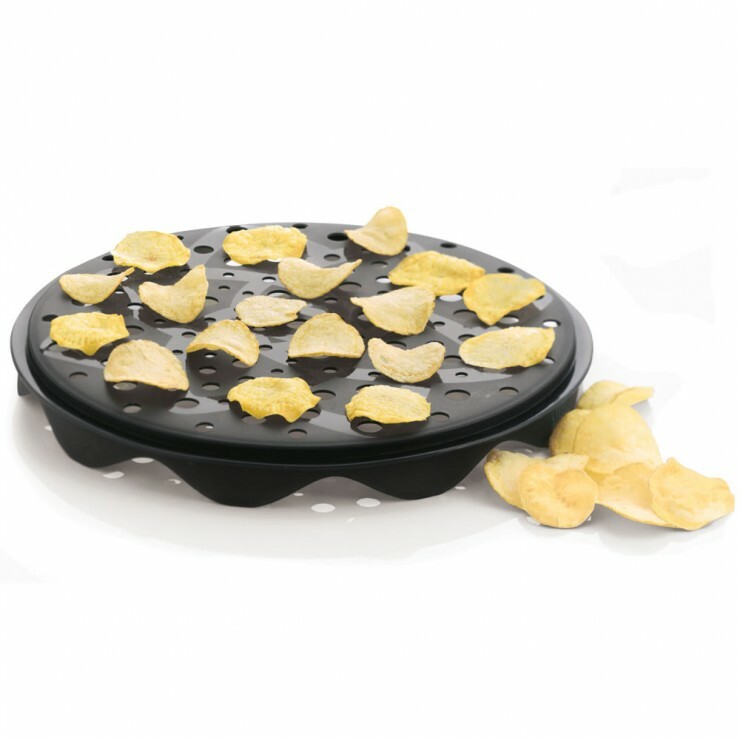 The patented silicone trays create convection heat that produces perfectly cooked chips in minutes without using a drop of oil. One reviewer on the Hammacher website said that the resulting chips were crispy indeed, but tasted more “potato-like” and “less oily.” And that it was a taste that “needed getting used to”. We’re not sure if that’s a polite way to say they tasted awful, but he did give the item a 4/5 rating. There’s three trays, so you can cook about 30 chips at once, or just about enough for a small snack. It’s $59, which isn’t exactly cheap, so we hope you’re really into low-fat cooking if you plan on getting this. ← Blend Test: iPhone 5 Vs. Galaxy Nexus S III, Which Will Blend First? my family has these (though we got ours somewhere else @ 2 for $25) they work pretty great and the chips taste awesome.